Samsung's Tizen phone sighted in the wild, or on eBay anyway. Samsung hasn't even announced its first Tizen phone yet but already someone is trying to sell it. The handset, which recent rumours suggest might be called 'Zeke' / 'Zeq', was listed on eBay for the not unreasonable price of $300 (£181.64), with the heading "New Tizen Samsung SM-Z9005 smartphone for apps development." 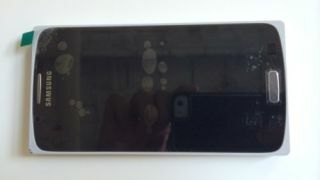 The listing, spotted over on GforGames came with a couple of images, giving as a closer look at the front and inside of the phone and the front image in particular is very reminiscent of a leaked photo that appeared only the other day, though this time it has a protective bumper around it, suggesting that it really is a developer unit. Other than the images, the listing also revealed that the handset comes with 16GB of storage and has a 4.7 inch display, which slightly contradicts previous rumours that it would have a 4.8 inch screen. We doubt that this is the full version of the phone, as it's unlikely Samsung would have let one wriggle out of its grasp this close to launch, but it's interesting to see that the brand is going after the same market segment as its popular Galaxy S range. Either way, we're starting to get a clearer picture of Samsung's first Tizen handset and with MWC 2014 just around the corner the missing pieces of the puzzle are likely to slot into place soon. Stay ahead of the game by reading up on Tizen.